Sgt. Maj. James Dever offers some insight on how the US military would handle a real Godzilla attack. Thankfully, Godzilla has (until now) been a product of fantasy, and we've never suffered in real-life attacks from giant radioactive dinosaurs. But what if we did? Godzilla (2014)'s Military Technical Advisor, Sgt. Maj. James Dever was asked how the U.S. military would hypothetically take on the monster, and, more importantly, whether they could do it. Despite the military usually amounting to no more than cannon fodder in these types of films, Dever is confident that the US military could stop a real-life Godzilla attack. "The military would be very successful," he said confidently, adding "With the manpower and the equipment we have, we'd definitely be successful in taking down Godzilla." He said that US would be quick to mobilize all of its military forces, from the navy to the air force to even ground troops, and they would simply be able to overwhelm the monster with numbers. 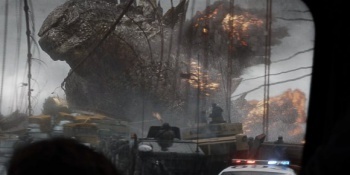 He did however see a couple of complications in a potential military vs. Godzilla showdown, in particular, Godzilla's fiery "Atomic Breath" and if the battle took place in a densely populated city. "Once he's in the city our major concern are all the civilians," said Dever. "The military would put their combined effort to move all the civilians out before we could engage him." As for the potential of using atomic weapons on the monster, Dever said that would probably only be a very last resort, as the decision would have to come from the President and would only be used after civilians were evacuated. "It's not a known thing fighting monsters," said Dever. "But we'd give it our best, and hope he would go down in a day or two."